This winter could bring the longest whiteout in Britain since the 1950s, according to weather forecasters. This would bring about many challenges, and would not be the best time to find out that your automatic doors are not working properly. 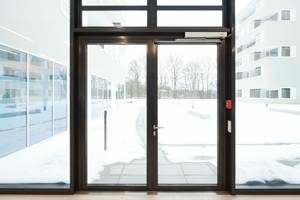 A malfunctioning automatic door would increase heat loss, increase chances of water ingress, and increase the carbon footprint of the building. The full list can be found on Geze’s website and it is strongly recommended that these checks be carried out to ensure your automatic door is working. Automatic doors can be very useful however caution is advised during extreme weather. This entry was posted in Advice and tagged automatic doors, carbon footprint, geze, maintenance, reduce heat loss, Snow, weather conditions, whiteout, Winter. Bookmark the permalink.